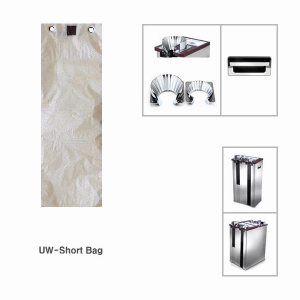 Automatic Wet Umbrella Wrappers give guests a neat and convenient way to stow their wet umbrella, preventing water accumulation and slippery lobby floors. 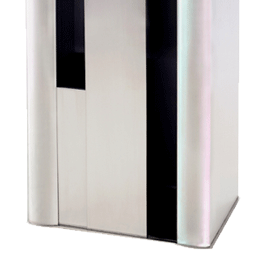 Now available with a unique double dispenser design to accommodate high traffic areas with a higher degree of visitor flow. Only Automatic Wet Umbrella Wrappers give guests the ability to wrap their wet umbrella in a single, fluid motion. New to our collection, our double dispenser umbrella wrapper accommodates larger crowds with twice the number of wet umbrella bags. 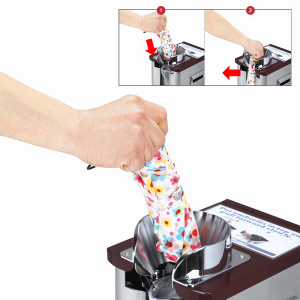 Reduces the need for dispenser refills, and ensures guests always have the ability to bag their wet umbrella. Now featuring a smart design that envelops umbrellas with minimal mess. With a larger top hole and improved wrapping mechanism, umbrellas are easily wrapped on the first try. Every Automatic Umbrella Wrapper is made with a stylish and sophisticated stainless steel finish and topped with black. 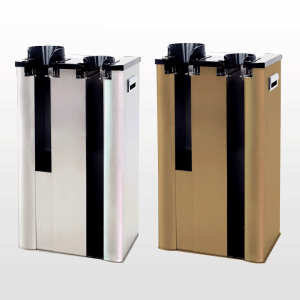 New gold finish is also available, creating a more sophisticated look to complement traditional décor. 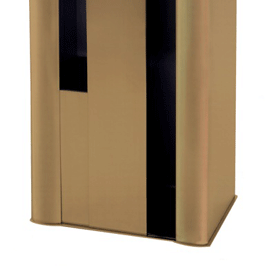 Each unit features a compact size, designed exclusively to minimize clutter while minimizing disturbance within busy entryways or reception areas. 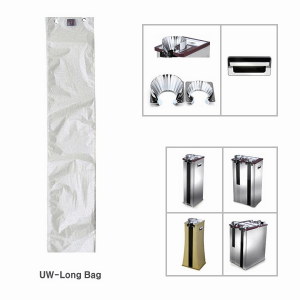 With an all-new advanced wrapping mechanism, Automatic Umbrella Baggers wrap both long and short (folding) umbrellas without tearing bags, partially bagging umbrellas, or other wrapping inconsistencies. Now manufactured with a larger top hole to ensure easy insertion and bagging. Larger top holes also feature grooves to guide both long and short (folding) umbrellas effortlessly into disposable umbrella bags. Unit wheels come standard, enabling quick and effortless movement without scratching, scraping, or damaging entryway floors. Fall and winter months are an exciting time for business. New school years, holidays, and other special events send crowds of eager customers to storefronts. Fall and winter months are also times when weather is unpredictable and dangerous. Proactively prevent weather from causing liquid accumulation, and protect both business and customer from accidental slip and fall. *Includes 2 boxes: One box of 1,000 long bags and one box of 1,000 short bags.